Last July, Dr. James H. McKerrow became only the second dean of the Skaggs School of Pharmacy and Pharmaceutical Sciences, which opened its doors to its first class in the fall of 2002. McKerrow is also an alumnus of UC San Diego—he earned his Ph.D. in biology in 1973, focusing on peptide chemistry and molecular genetics. He then went on to receive his M.D. from SUNY Stony Brook, with an internship in Internal Medicine. He completed his residency in pathology at UC San Francisco, then continued there as a postdoctoral fellow and clinical instructor, eventually becoming professor of pathology and most recently serving as director of the Center for Discovery and Innovation in Parasitic Diseases. 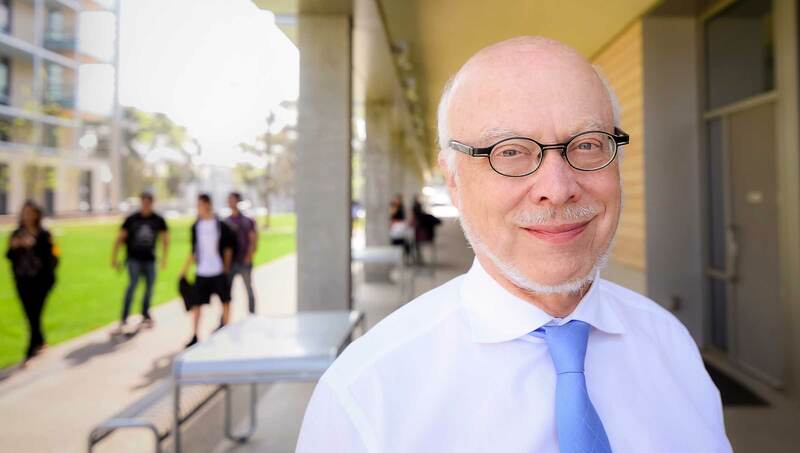 An expert in the area of neglected tropical diseases, McKerrow has brought a wealth of experience in natural product research and drug discovery and development to UC San Diego. His keen interest in these areas brings together cross-disciplinary researchers across our campus and in the community—in global health, biology, chemistry, engineering and drug development programs. McKerrow is an active teacher and mentor in graduate and postdoctoral programs, lectures to medical and health profession students and has hosted underrepresented students each year for summer research internships. Committed to fostering science education in the community, he gives talks each year to elementary and high school students, and has presented several public lectures in the “Ask a Scientist” series in San Francisco. At any given time, Skaggs School of Pharmacy faculty are teaching and training approximately 240 PharmD students, 60 Ph.D. students and 30 pharmacy residents. The school offers an innovative and flexible curriculum leading to the Doctor of Pharmacy degree, taught by health sciences faculty in close association with the clinical, research and academic programs of the UC San Diego School of Medicine. What guided your transition from researcher to researcher-administrator? How do your experiences as a researcher inform your choices as a leader? I think what attracted me to be involved in administration as well as research is the opportunity to build bridges, not only from laboratory to laboratory, which is how science is done, but from school to school. And so one of the things I wanted to do when I came here is break down any silos that might’ve existed not only between the Skaggs School of Pharmacy and the School of Medicine, but between the pharmacy school and the campus as a whole. How does being a UC San Diego alumnus help you in your current position? As some people may know, I’m also an alumnus of UC San Diego — I got my Ph.D. here. So, I have connections with the Division of Biological Sciences and department of chemistry and biochemistry that other people might not have. And so that has made it a lot easier for me to reach out to colleagues across the campus and to foster what I would consider more interdisciplinary research than had occurred in the past. What is unique about the Skaggs School of Pharmacy? I think the important thing about the Skaggs School of Pharmacy is that it’s very innovative in two areas: the first is education and the second is research. It’s innovative in education because the role of pharmacists is rapidly changing. So now the pharmacist is becoming more of a primary health care provider. The Skaggs School of Pharmacy is at the forefront of understanding that and educating the pharmacists of the future, rather than the pharmacist of today. The Skaggs School of Pharmacy is also one of few of what we’d call “research-intensive” pharmacy schools in the country. That means we have a very vibrant research program in drug discovery and development that goes hand-in-hand with our educational initiative.